This text details the relationship between membrane technology and bioprocesses, discussing applications. This second edition refines and optimizes key features of the first edition - and features new illustrative case studies. 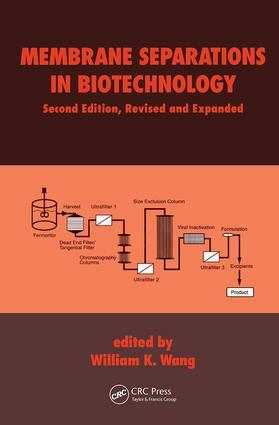 The book examines advantages and disadvantages of using standard and new membrane technologies; analyzes a wide range of applications, including cell culture harvesting and product and process validation techniques; and more. "Praise for the previous edition. . . . . .an excellent book that is well worth reading. . .. . . .offers excellent coverage of the practical considerations involved in applying membranes to a broad range of use[s] and should prove interesting and worthwhile reading to potential membrane users and membrane technologists. " ". . .should be bought by all workers concerned with ultrafiltration or reverse osmosis membranes. . .. . . .experienced workers will find this an excellent source book for biotechnology-oriented material. " ". . .provid[es] a useful and practical summary of membrane separations in biotechnology. " ". . .a timely source. . ..Numerous applications should broaden the horizons of all biotechnology worker[s]." ". . .a remarkable book. . .impart[s] both some of the sense of the difficulties in putting membranes into practice in biotechnology and some sense of the various approaches to tackling membrane separation problems." ". . .comprehensive. . ..clear, unambiguous. . .easy to read." ". . .worthy of consideration by anyone interested in food processing, downstream processing of fermentation broths or effluent disposal." "This book is highly useful. . ..places the applicability of membrane systems in their proper perspective." Protein transport in ultrafiltration hollow-fibre bioreactors for mammalian cell culture; vortex flow filtration for cell separation in bioreactor operations; crossflow membrane filtration of fermentation broth; cross-flow microfiltration with backpulsing; the effects of different membrane modular systems on the performance of cross flow filtration of picha pastoris suspensions; filter applications in product recovery processes; ultrafiltration membranes in the vaccine industry; protein purification by affinity ultrafiltration; process development for the isolation of a recombinant immunofusion protein using a membrane adsorber; high performance tangential flow filtration; virus removal by ultrafiltration - a case study with diaspirin crosslinked haemoglobin (DCLHb); scale up and virus clearance studies on viral filtration in monoclonal antibody manufacture; virus removal filtration.